A trip to the airport can be stressful at any time, but a visit during the chaos of Holiday travel season takes everything up a notch. 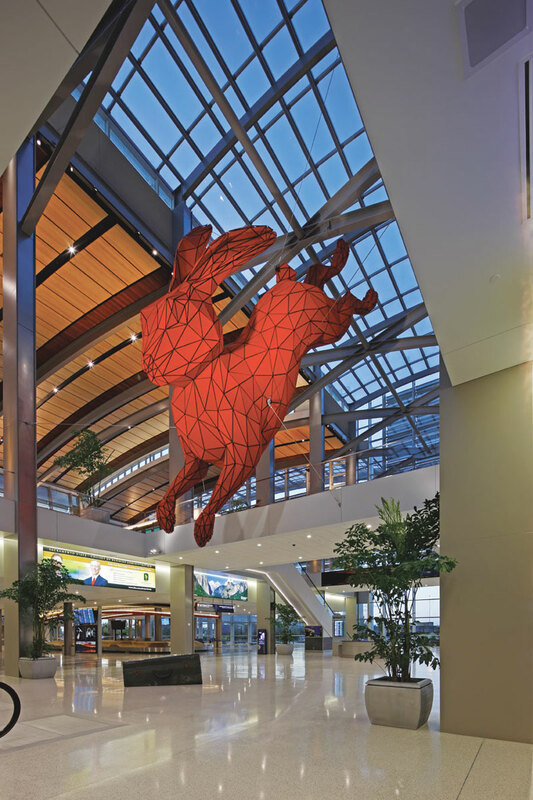 But, for Sacramentans there is good news: the new Sacramento terminal is the antidote for the holiday blues, a soaring light-infused structure with a spacious, modern feel, and – best of all – a collection of artwork you won’t forget. As you continue through the terminal, familiar names pop up like old friends. Cafeteria 15L, Old Soul, Burgers and Brew, Esquire Grill, Dos Coyotes, Jack’s Urban Eats, Java City Eco-Grounds Café, and Visions Of Eden, a sister of the J Street shop, dot the landscape along with new names and lend a comfort level to the structure that is reassuring. And then there’s the art. Complementing the rabbit are commissioned works by artists from many other parts of the country along with the River City itself. 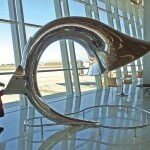 Many visitors find Donald Lipski’s Acorn Steam (an anagram for Sacramento) the most arresting of the airport exhibits. It is an imposing sight: a spectacular spreading metal tree covered with a simulated latex bark and branches glittering with thousands of crystals. Up close it is like a special jewel box. Viewed from a distance it dominates the landscape around it. As you cross the area leading to the shops and restaurants, two floor renderings stand out, Joan Moment’s A Fragment of the Universe and Suzanne Adan’s Flying Colors. Each artist created a painting which was then recreated as an eighteen by twelve foot floor mosaic by a firm in Germany. Once the mosaics were completed and approved they were then disassembled for shipment to Sacramento where they were reassembled. Moment’s piece is a stunning blue image with brightly colored circles and droplets depicting cosmic phenomena. Adan, a Sacramento artist who teaches at Sacramento City College, created an equally stunning mosaic which utilizes her whimsical style to depict birds in black and white augmented by orange, green and ochre. Lyn Criswell’s As the Crow Flies, a third mosaic of terrazzo, aluminum plate and polyurethane plastic of equal size and artistry with bird cages suspended overhead completes a splendid introduction to the terminal’s concourse approach and will engage visitors whether they are or are not art fans. Other art pieces are equally intriguing and favorites will vary from visitor to visitor. 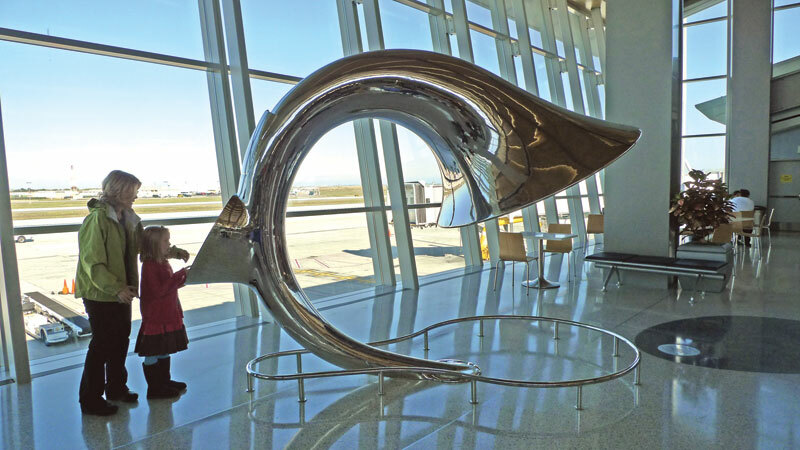 A Dr. Seuss-like ten foot horn, Your Words are Music to their Ears, by Living Lenses (a team consisting of Louise Bertelsen and Po Shu Wang), plays tones generated by samplings of typed words. Active Ecosystems (SMF) by Camille Utterback and Michelle Higa, features arriving visitors projected on a glass elevator. Christain Moeller’s The Baggage Handlers is a huge wooden portrait of six baggage handlers. Mildred Howard’s This House Will Not Pass for any Color but its Own, a dynamic walk-in structure in painted steel and hand blown glass completes the second floor art ensemble. Ned Kahn’s Airside in aluminum and steel may be seen from the fast moving people mover which takes passengers to their gates. A beautiful painting by Sacramento’s incomparable Gregory Kondos titled Sutter’s Gold may unfortunately only be seen by visitors flying into the International Terminal. So, as you’re packing for that holiday trip, or checking the arrivals schedule for your loved one’s flight, don’t forget to give yourself some extra time to relax and enjoy one of the region’s best public spaces. Think of it as a special holiday treat.